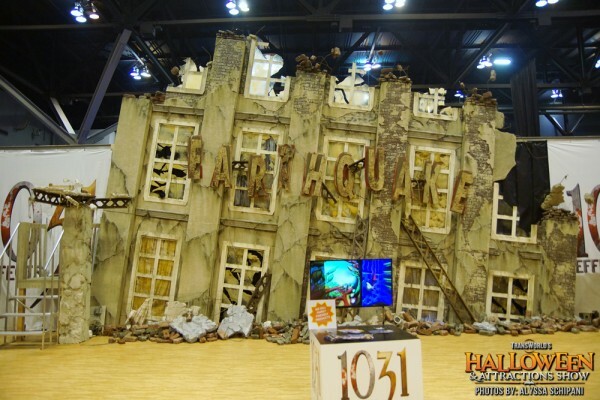 For the past 20 years, TransWorld’s annual Halloween & Attractions Show has created the ultimate marketplace for the Haunted Attraction industry. 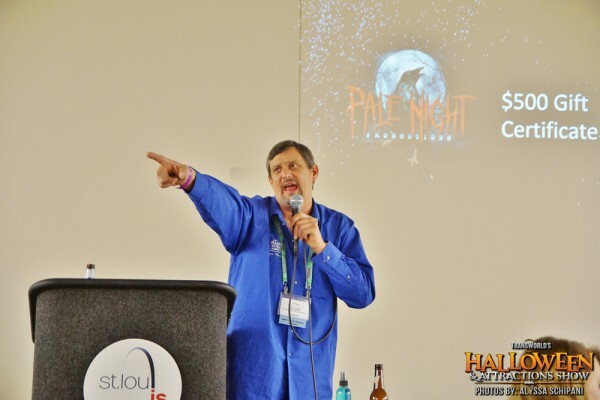 Every year in March, attraction owners, operators, and designers gather from around the world in St. Louis, MO to network, get fresh ideas, and purchase new products for their attractions. 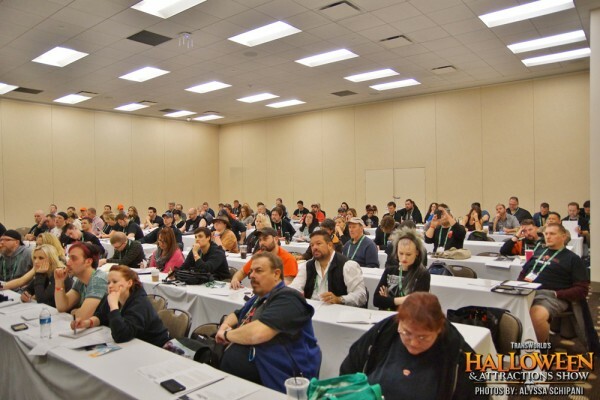 With hundreds of the worlds best haunt vendors and professional make-up artists all in one location, this is “THE” show for haunted house owners and operators. Here you will see some of the world’s top pneumatic props as well as the latest and greatest high tech attraction gadgets. The show brought some amazing new products and a glimpse of what to expect for the rest of the year. If you’re longing for the smell of fog, or the intense sounds of screams, you don’t have to wait until October. 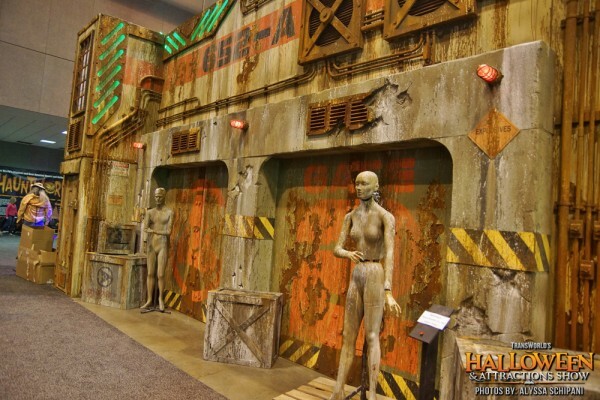 As soon as you stepped onto the 2015 show floor the first thing guests noticed was the skyscraper booths! 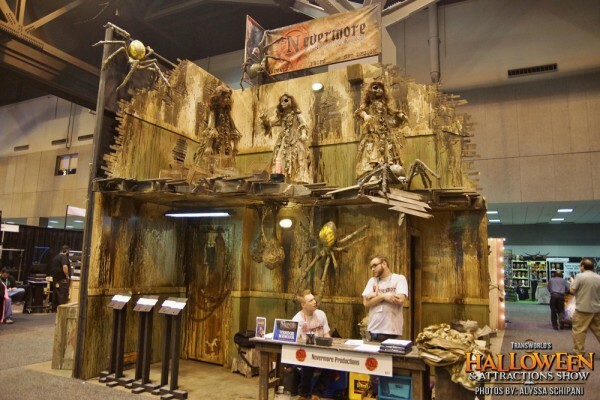 In 2015 many of the larger vendors built their booths sky high featuring mini haunt walk-thrus. 2015 was definitely “year of the vertical booths”. 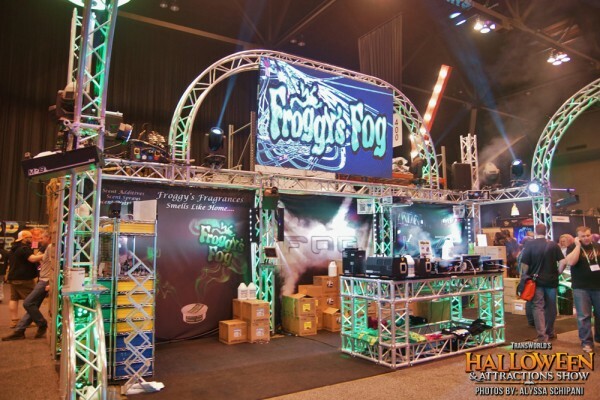 TransWorld has always been the place where vendors release their new creations for the year. 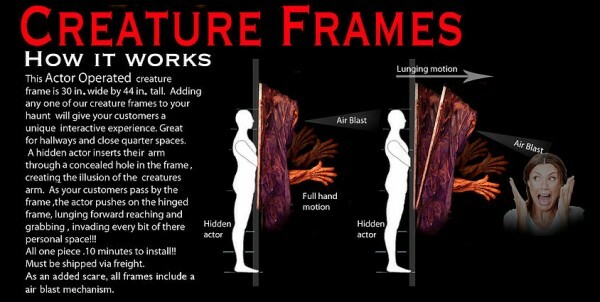 One of the standout products this year was the actor operated “Creature Frame” from a new vendor called Crossbreed Haunted Productions. Which also won the HAA Best New Product Award. Gantom, (formerly darklight) also released an innovative product this year called the “Torch”. 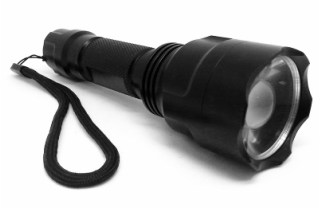 The Torch looks like a small flashlight built with rugged aluminum housing. Using an iPhone app and the BlinkFX MiniEmitter, you can turn the Gantom Torch on and off, make it flicker, strobe or change colors. 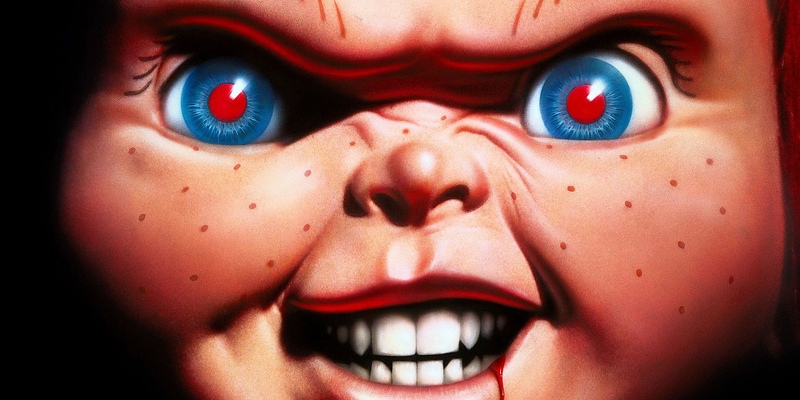 Attractions can allow their customers to enter a dark maze armed with a flashlight that suddenly shuts off leaving them alone in the dark, or can change to a different color such as blood red in a slaughterhouse room. This is the start of next generation interactive haunt technology! For more info visit their site at www.gantom.com. 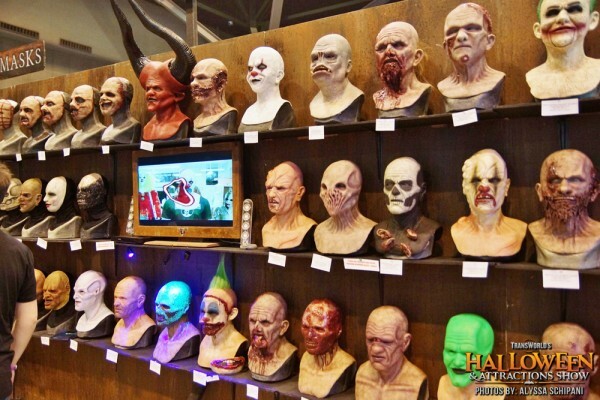 Another vendor that has been the game changer in the Halloween and horror industry is Zombie Skin. 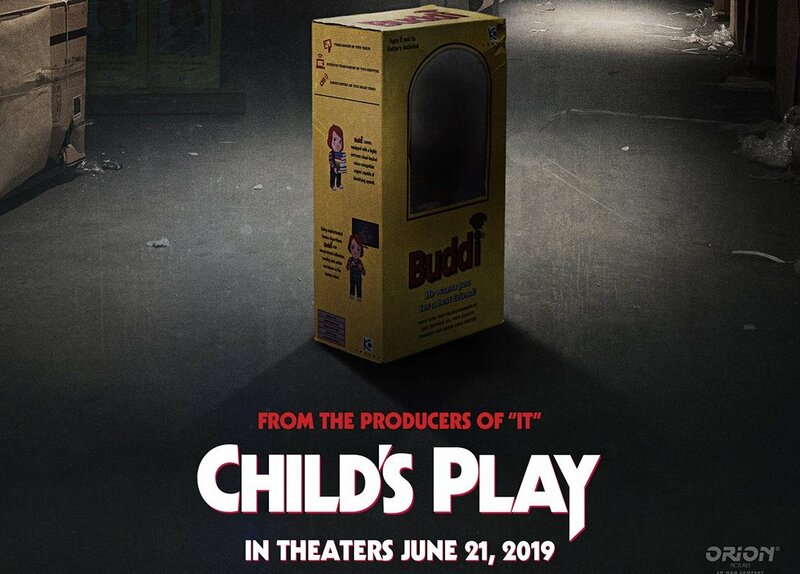 This is an amazing ammonia-free, super fast drying latex being used in many top haunts, TV shows, and now even on movie sets! It has the consistency of whipped butter or whipping cream and can be used alone for cuts, gashes, wounds, bites, claw marks, and the rest is up to your imagination. 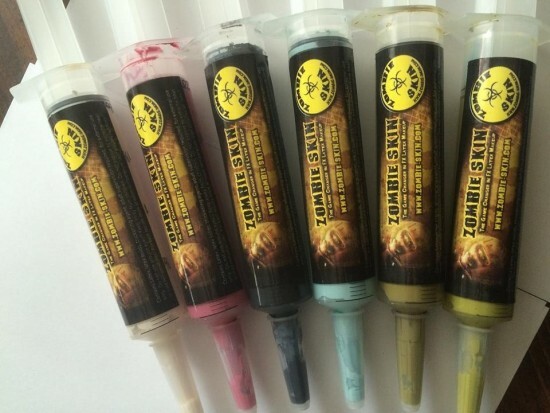 For 2015, Zombie-Skin released a line of colors available in their “Hypo” syringes. 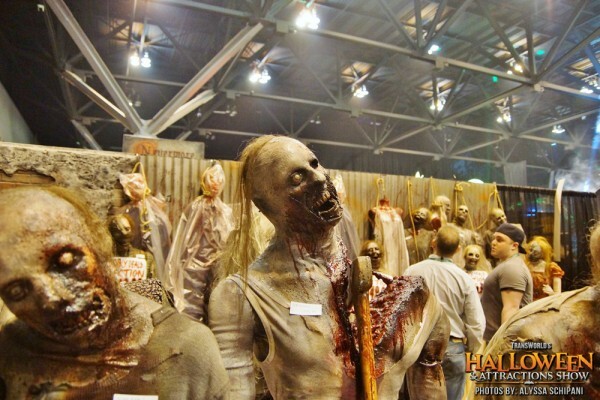 Hypos are available in Flesh., Red, Black, Vein Blue, Decayed Corpse, and of course Zombie Rot! For more info visit their site at www.zombie-skin.com. 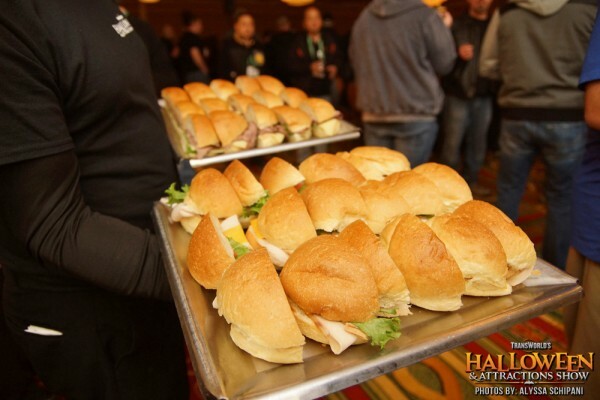 Aside from all the awesome new products, there are also parties and special events that atke place. 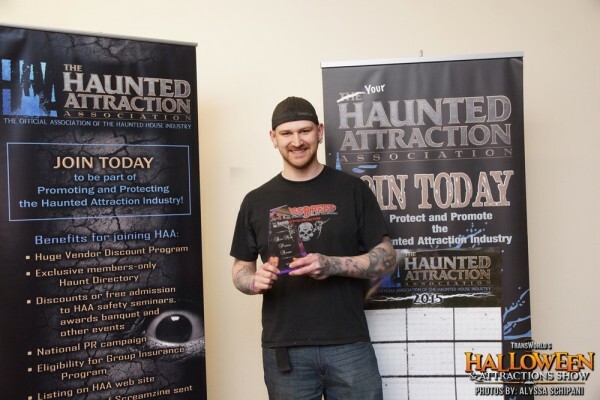 This year the opening night party was Sponsored by Donat Insurance and The Haunted Attraction Association. 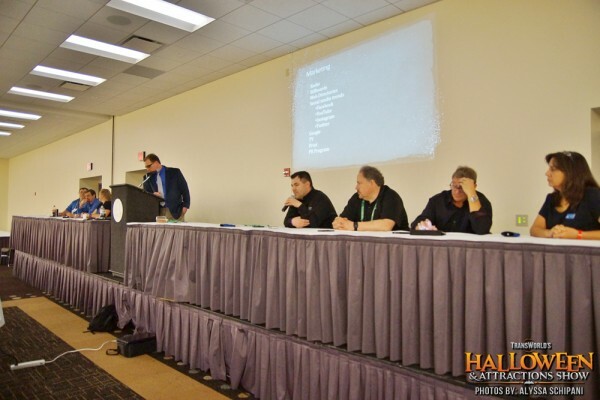 The TransWorld Seminar Series is something that makes the show o-so-sweet! 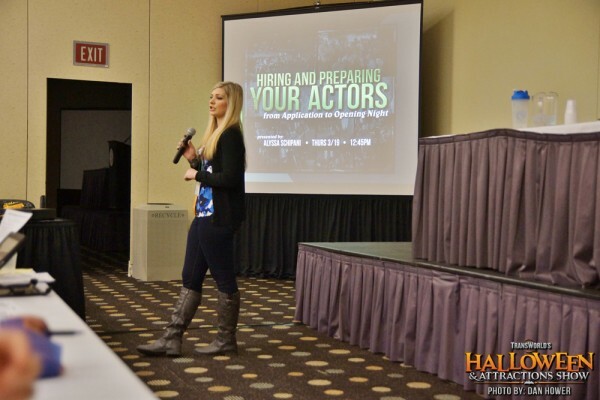 The seminars are led by some of the industries top professionals covering everything from getting started in the haunted attraction industry to more advanced classes for seasoned veterans. 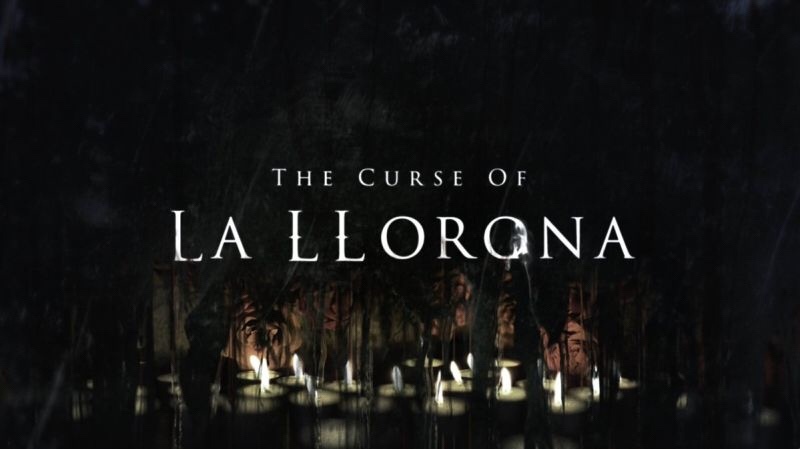 Lot’s of industry secrets are taught and shared from owners, operators, and vendors, who belong to some of the best haunted attractions around the world. This educational series is vital if you own or operate an attraction. 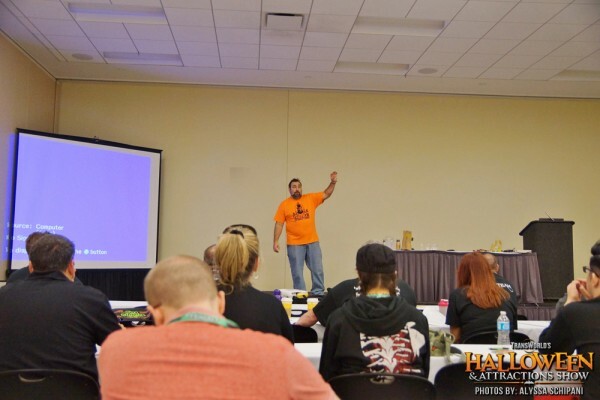 No other show offers the amount of quality knowledge in one place as TransWorld’s HAA Show. 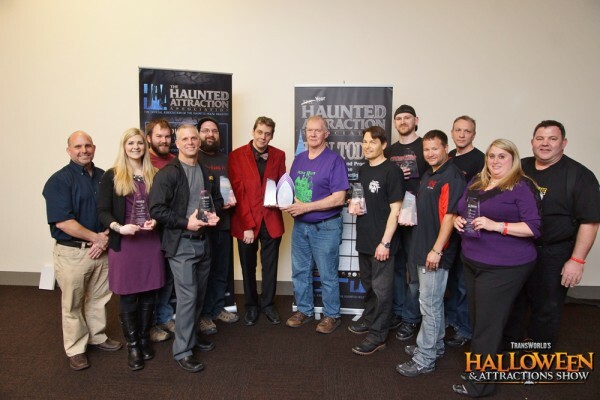 Another annual event at TranswWorld is the Haunted Attraction Association OSCARES Awards Banquet. 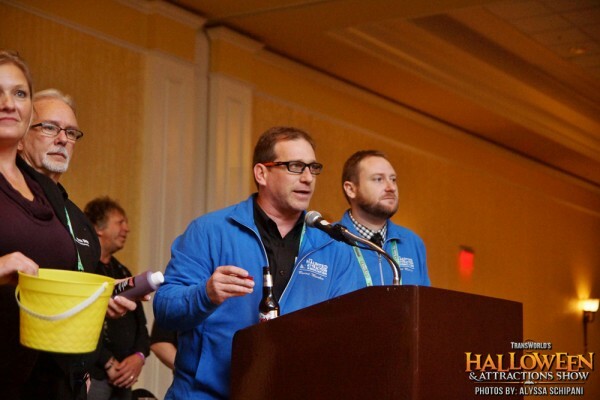 Similar to the famous “Oscars aka Academy Awards,” this is where the industry rolls out the “black carpet” to honor the folks in the haunt industry who show professionalism, leadership, integrity, commitment, and inspire others to do the same. This is the highest level of achievement in the haunt industry. 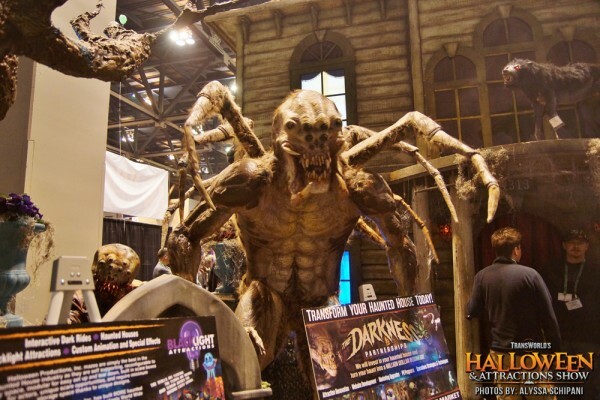 TransWorld is much more than just the typical Halloween and horror convention. You really have to do your homework before attending a show of this magnitude. It’s so big and there’s no other show that EVERY vendor attends! Another cool event is the annual Giant Auction. 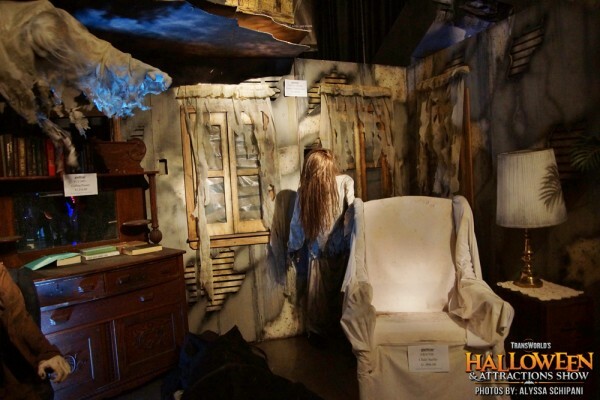 Each year, vendors donate some of their most popular, expensive, and prestigious props, animatronics, and services to the Haunted Attraction Association Giant Auction, making it a great place to land big items for a great deal! Attendees can bid on tons of the industries top items, sometimes items even go for a fraction of the retail price! The auction took place on Friday, which was great for buyers. If you didn’t win the item you wanted at the auction, buyers still had two days on the show floor to visit the vendor and purchase the item they wanted. 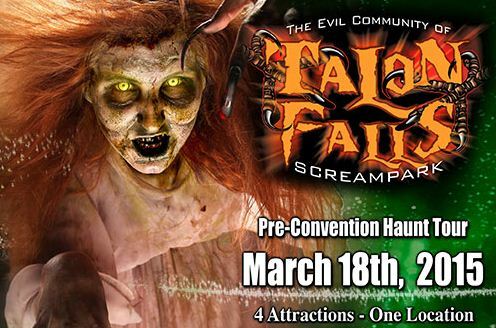 Something new for 2015 was the TransWorld pre-convention bus tour that took guests to Talon Falls ScreamPark in Melbre, Kentucky. Patrons did a full actor tour as it operates during season, including the hayride. Guests wrapped up with a social gathering at the Talon Falls event barn. We are hearing there is already big plans for the 2016 tour and can’t wait! 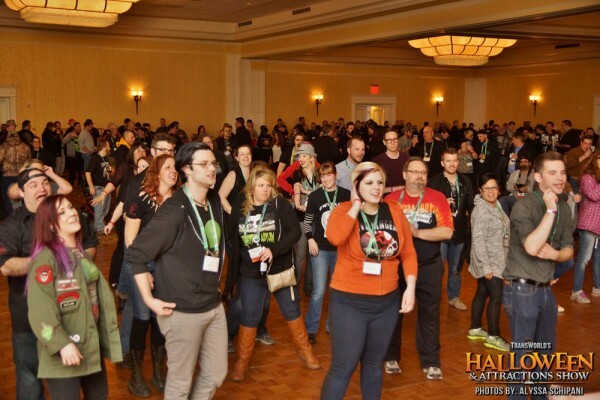 There was so much packed into this amazing week of haunted goodness that we couldn’t even attend every event. There’s so much to see and do at TransWorld that you have to study study study and choose your schedule wisely! 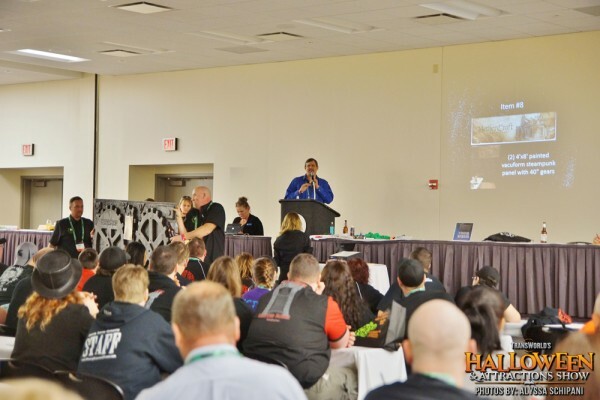 Planning has already started and rooms are already being booked for TransWorld’s 2016 show. 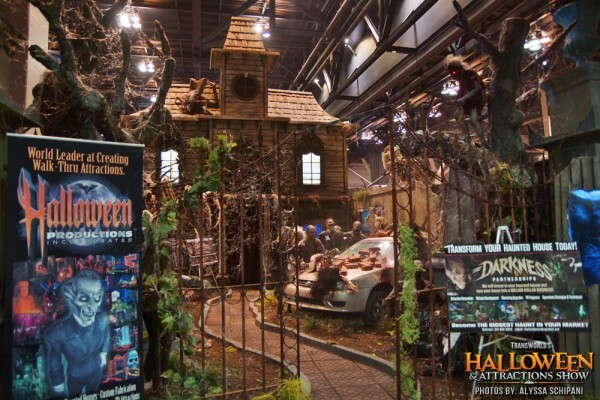 For more information about TransWorld’s Halloween & Attractions Show, visit the official website by clicking here! The fun is just getting started with haunt season. 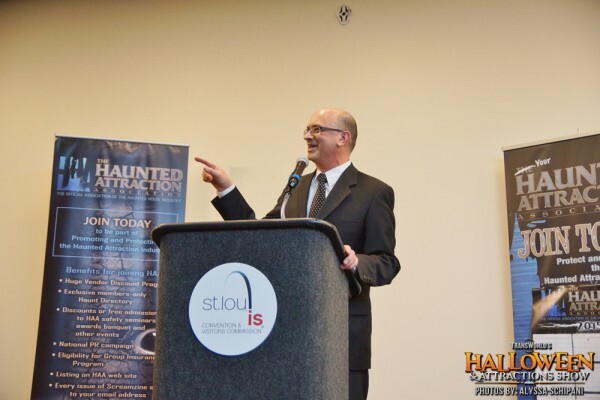 There are several more haunt related shows happening this through-out the year! 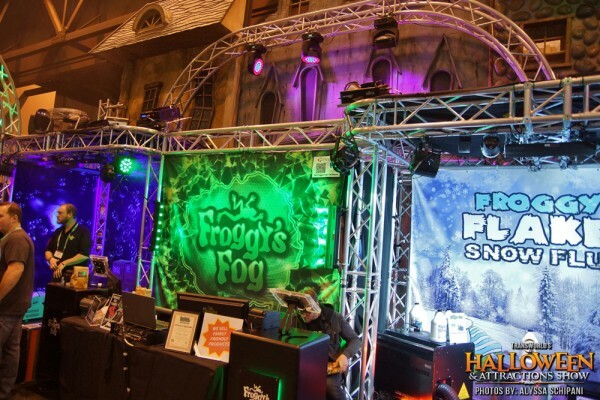 While most of these shows aren’t open to the public for the full run, TransWorld are now the producers of the “Midwest Haunters Convention” and Halloween Extreme, which are both open to the public. 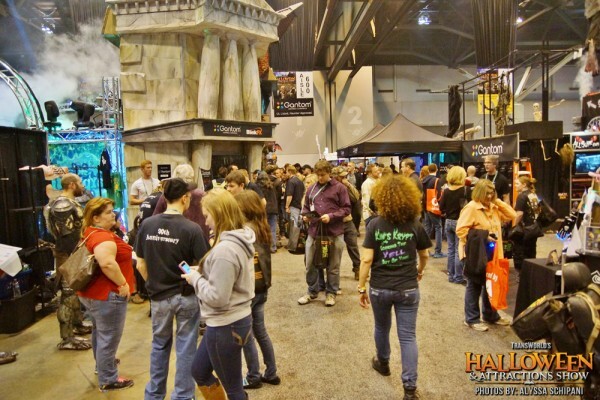 Halloween Extreme will be combined with Spooky Empire’s May-Hem show, geared more toward enthusiasts and celebrities. They will also host a bus tour showing off some of central Florida’s popular Halloween Attractions. MHC will offer home haunters and Halloween enthusiasts the chance to see, and most importantly buy the same things you see in your favorite haunted houses. 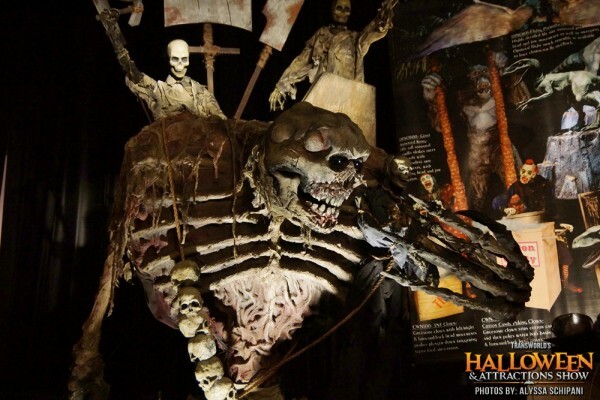 This is a once in a lifetime chance to get educated by the industry leaders while buying some of the most gruesome and gory things for your local haunt. Make your home the most popular house on the block! 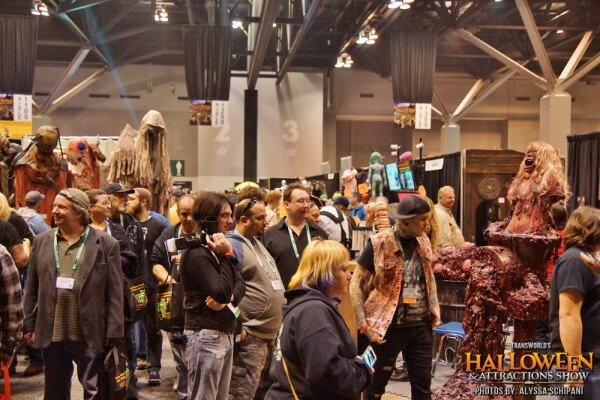 In addition to the trade show floor, TransWorld will be offering a full weekend of haunt tours, events, and parties celebrating all things horror May 29-31, 2015!